An investigation by Cycling in Dublin has revealed how the advertising industry’s self-regulation body deals differently with motoring and cycling complaints. 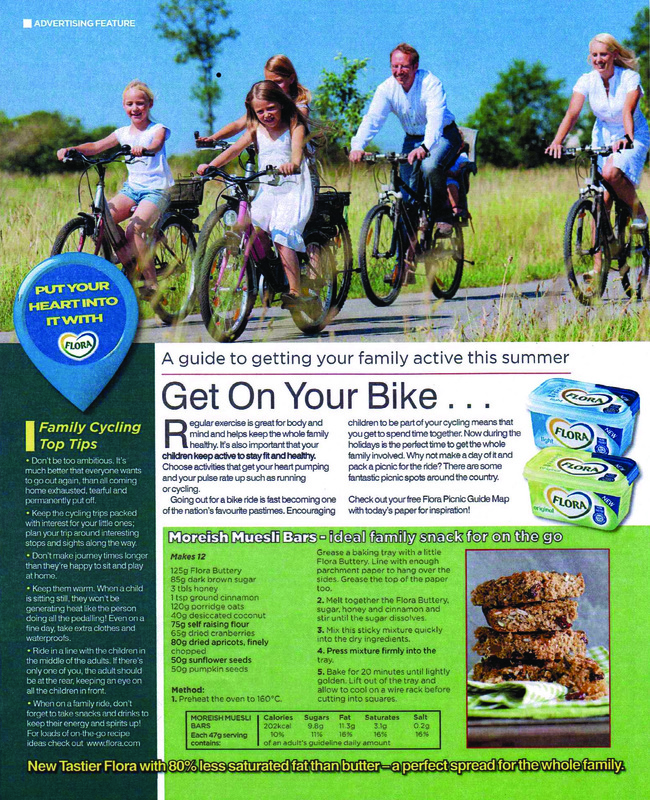 Email records released to this publication under environmental freedom of information legislation show how the Advertising Standards Authority for Ireland (ASAI) contacted the Road Safety Authority (RSA) for advice on complaints about cycling, but the standards body did not do the same for a complaint this publication made about depictions of motoring offences. However, a Road Safety Authority spokesperson has confirmed that the ASAI only consulted the organisation twice for advice last year and both requests were in relation to cycling. “During 2012, the Advertising Standards Authority of Ireland (ASAI) sought the advice of the RSA on two occasions in connection with complaints it had received in relation to advertisements,” said Eamonn Kennedy at the RSA, in response to a freedom of information request last year. The two complaints made to the ASAI by members of the public were upheld by the standards body. But the ASAI rejected a test complaint about a car advert, which was made by this newspaper, and failed to contact the RSA for advice. “I can confirm that we have not received any further requests from the ASAI to date this year,” Kennedy said in a response in February. The RSA said the advice provided by it was written by its communications manager rather than its policy section, but was consistent with its general advice. “The advice, in response to concerns expressed regarding cycling practices depicted in the advertisements, was based on, and is consistent with, the advice provided by the RSA,” said Kennedy. For one of the adverts it is still unclear why the RSA was consulted at all, given that the advertisers state the image portrays “a very quiet path in a park”, and the RSA remit is exclusive to “the promotion of public awareness of road safety”. The ASAI did not directly reply to comment about this. The RSA has said the advice provided by it was in response to a request from the ASAI for its views on the matters complained about by members of the public. When the Irish advertising industry’s self-regulation body effectively banned an image of a family cycling in a park, and a clip showing an attempted humorous depiction of a cyclist following a bus to get free internet, we started an investigation which highlights how differently complaints about depictions of motoring and cycling are handled. One of the complaints upheld by the ASAI was for an advertorial – a paid-for advertisement presented to look like newspaper or magazine content – for Unilever brand Flora which was printed in the Irish Daily Mail. It depicted a family cycling without helmets in what appears to be a relaxed and quiet park setting. It added that Unilever pointed out it is not a legal requirement to wear a cycle helmet and therefore the depiction was in compliance with the law. The second advert, broadcast on TV and on YouTube, shows a helmeted man cycling down a road chasing a bus in order to get free WiFi. A voiceover said: “Meteor wrote the book on value, page 98 tells you how to get free mobile internet”, and both the voiceover and on-screen text says “do not chance it”. 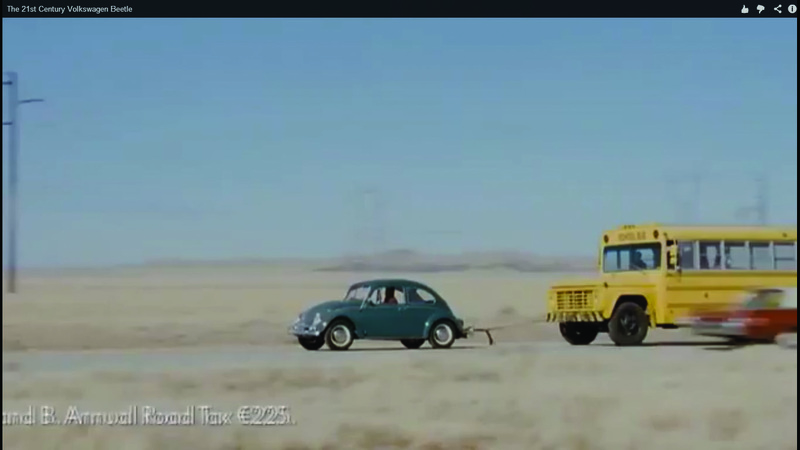 A still from the Volkswagen Beetle ad with a car towing a large bus – now illegal under Irish law. Section 2.29 of the Manual of Advertising Self-Regulation is listed under the heading, “Safety”, and states: “A marketing communication should not encourage or condone dangerous behaviour or unsafe practices except in the context of promoting safety.” There is no other exception listed to rule 2.29. As a test case, this publication filed a complaint about a car advertisement, just as if we were acting as a member of the public. 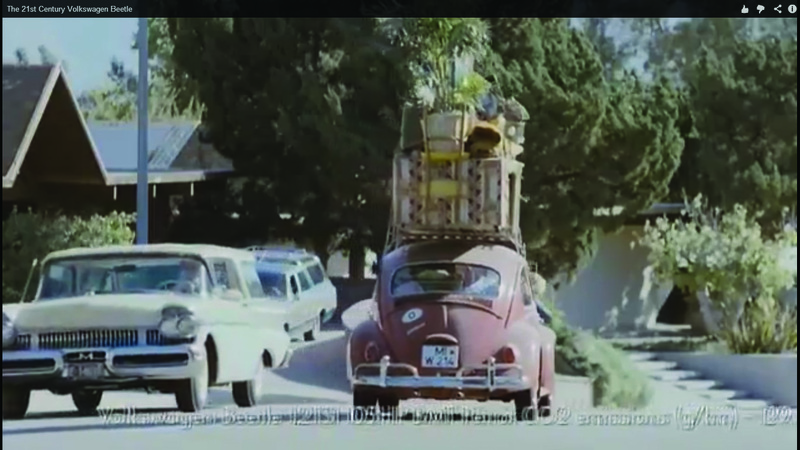 The test advert was “The 21st Century Volkswagen Beetle” – which is still on the “VolkswagenIreland” YouTube page at the time of writing this article. It depicts a number of unsafe and illegal motorist actions including: speeding; reckless driving; improper towing of vehicles; and a dangerous load. The ASAI rejected the complaint in a letter dated January 29 of this year. “In this case, when we received your complaint, we reviewed the advertising in question. We do not consider it to be condoning unsafe practices but rather to be reflecting on the heritage of the car. We therefore do not consider the advertising to be in breach of the requirements of the Code,” said Orla Twomey, the assistant chief executive of the ASAI. We then pointed out to the ASAI that the advert includes “clearly illegal” behaviour and asked why the RSA was not consulted.The complaint then went to the ASAI complaints committee. On February 19, a letter signed by Frank Goodman, the chief executive of the ASAI, said that the committee reviewed the file on the complaint at a recent meeting and it “agreed with the secretariat’s finding”. Is the ASAI aware that there are strict laws in Ireland around towing of vehicles, dangerous loads, speeding and reckless driving? And, if so, why is the ASAI so willing to allow depictions of all three in one advert? Why did the ASAI seek RSA advice on the matter of a family cycling in a park without helmets (which have no legal standing in Ireland), but not for a complaint about a car company advert (which relates to fairly clear depictions of law breaking)? If depictions of motorists breaking the law is treated as — as the ASAI stated — “reflecting on the heritage of the car” why are depictions of cyclists being subjectively unsafe not seen as reflecting on the heritage or culture of the bicycle? Is the ASAI aware that the RSA only has a remit on roads and not on park trails or other off-road paths? 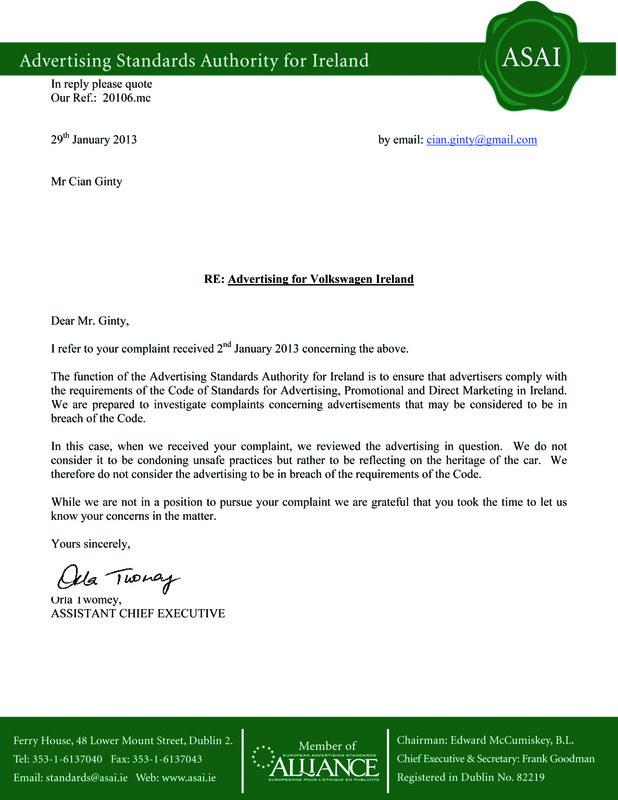 Given the apparent conflict of interest the advertising industry has with the motor industry (the latter’s large yearly advertising spend), one group has claimed to us that the different treatment of complaints is another case of failed self regulation – Does the ASAI have any comment on this? After a second attempt to get a reply, Goodman said: “We don’t set policy in relation to cycling or motoring, we don’t go to the RSA with every cycling complaint and we don’t go to them with every motoring complaint. We have far more complaints about motoring than about cycling and we would go to them with a lot of those motoring complaints. At no point was it put by this publication that the ASAI is “anti-cycling”. Originally published in the Summer 2013 edition of the Cycling in Dublin newspaper, which can be viewed or downloaded here. Perhaps Cycling in Dublin will not say it, but I certainly will: ASAI is anti-cycling. Any promotion of cycling helmets which does not equally promote helmets for car drivers and pedestrians is hypocritical and bigoted. Cycling is a very best transport always. And helmet should be wear always during cycling. It is for safety. But is hold not compulsory for always to wear helmet. Government can make law according to convenience of people. This is what I think.